Home | Serigraphs and Giclee Fine Art | Liudmila Kondakova Parisian Art | Liudmila Kondakova Signed And Numbered Limited Edition Serigraph:"Au Bon Marche "
Liudmila Kondakova Signed And Numbered Limited Edition Serigraph:"Au Bon Marche "
Edition::Signed and Numbered Limited Edition Serigraph 100 = Canvas is Sold Out. Image size: 32 " x 37 1/2 "
About the Print: "To me these streets, cobblestones and aged buildings evoke a sense of nostalgia and romance with a touch of melancholy. In my art, the essence and beauty will always rest in the details." - Liudmila Kondakova Lamplight brightens the cobblestone path and the store front windows. The charming sidewalk cafe serves apertifs and port, and the sweeping terrace offers a vantage point from which to view passers-by. "Au Bon Marche", exquisitely depicted in painstaking detail, is imbued with a delicate nostalgia and a whisp of melancholy as the evening shadows fall long on the Parisian thoroughfare. "Au Bon Marche" draws us down the street and invites us to investigate the antique shop, venture through the hand carved mahogany doorway, or stop in the cafe that tempts us with savory treats. Kondakova uses a gem-tone palette to achieve the dazzling color and warmth that so strongly appeals to the senses. Her imagery of Parisian life is fresh and crisp - every last detail is refined. The wrought iron terrace railing, the glow of the lamplight in the doorway, and the distressed facades are magnificent visions of old Paris. 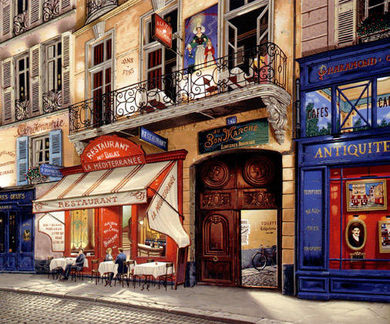 Kondakova's style of romantic realism is perfectly characterized through "Au Bon Marche". There is a romance captured that entices and engages the viewer. We envision ourselves walking down the street, hand-in-hand with a lover, perhaps stopping for a cafe au lait in the night air. Kondakova is a storyteller of sorts, one who begins the story by sharing with us the details, yet it is up to us to spin the tale and create magic by losing ourselves in her art. Home | Fine Art Prints & Limited Editions | Gallery Direct Art is your Authorized Chalk & Vermilion Dealer | Liudmila Kondakova Parisian Art | Liudmila Kondakova Signed And Numbered Limited Edition Serigraph:"Au Bon Marche "